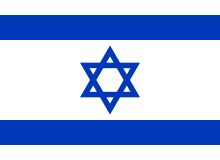 Israel (/ˈɪzriəl, ˈɪzreɪəl/; Hebrew: יִשְׂרָאֵל; Arabic: إِسْرَائِيل‎), officially the State of Israel, is a country in Western Asia, located on the southeastern shore of the Mediterranean Sea and the northern shore of the Red Sea. It has land borders with Lebanon to the north, Syria to the northeast, Jordan on the east, the Palestinian territories of the West Bank and Gaza Strip to the east and west, respectively, and Egypt to the southwest. The country contains geographically diverse features within its relatively small area. Israel's economic and technological center is Tel Aviv, while its seat of government and proclaimed capital is Jerusalem, although the state's sovereignty over Jerusalem has only partial recognition. The Yishuv (Hebrew: ישוב‎, literally "settlement") or Ha-Yishuv (the Yishuv, Hebrew: הישוב‎) or Ha-Yishuv Ha-Ivri (the Hebrew Yishuv, Hebrew: הישוב העברי‎) is the body of Jewish residents in the land of Israel (corresponding to Ottoman Syria until 1917, OETA South 1917–1920 and later Mandatory Palestine 1920–1948) prior to the establishment of the State of Israel. The term came into use in the 1880s, when there were about 25,000 Jews living across the Land of Israel, then comprising the southern part of Ottoman Syria, and continued to be used until 1948, by which time there were some 630,000 Jews there. The term is used in Hebrew even nowadays to denote the Pre-State Jewish residents in the Land of Israel. Human rights in Israel refers to human rights in the State of Israel both legally and in practice. The subject has been evaluated by intergovernmental organizations, non-governmental organizations (NGOs) and human rights activists, often in the context of the Israeli–Palestinian conflict, the wider Arab–Israeli conflict and Israel internal politics. National parks of Israel are declared historic sites or nature reserves, which are mostly operated and maintained by the National Nature and Parks Authority. 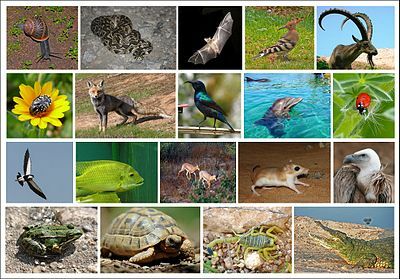 As of 2015, Israel maintains more than 400 nature reserves that protect 2,500 species of indigenous wild plants, 20 species of fish, 400 species of birds and 70 species of mammals. The current borders of the State of Israel are the result both of war and of diplomatic agreements among Israel, her neighbors, and colonial powers. Uniquely, only two of Israel's five potential land borders are internationally recognized while the other three are disputed. Israel's borders with Egypt and Jordan have now been formally recognized and confirmed as part of the peace treaties with those countries. The borders with Syria (Golan Heights), Lebanon (Shebaa farms) and the Palestinian territories (declared as the State of Palestine) are still in dispute. Science and technology in Israel is one of the country's most developed sectors. Israel spent 4.2% of its gross domestic product (GDP) on civil research and development in 2013, one of the highest ratios in the world. In 2019, Israel was ranked the world's fifth most innovative country by the Bloomberg Innovation Index. It ranks thirteenth in the world for scientific output as measured by the number of scientific publications per million citizens. In 2014, Israel's share of scientific articles published worldwide (0.9%) was much higher than its share of the global population (0.1%). It also has one of the highest per capita rates of filed patents. The Israel Security Agency (ISA, Hebrew: שירות הביטחון הכללי Sherut ha-Bitaẖon haKlali "the General Security Service"; Arabic: جهاز الأمن العام‎), better known by the acronym Shabak (Hebrew: שב״כ, IPA: [ʃaˈbak] ( listen), Arabic: شاباك‎) or the Shin Bet (a two-letter Hebrew abbreviation of "Security Service"), is Israel's internal security service. Its motto is "Magen veLo Yera'e" (מגן ולא יראה, lit. "Defender that shall not be seen" or "The unseen shield"). 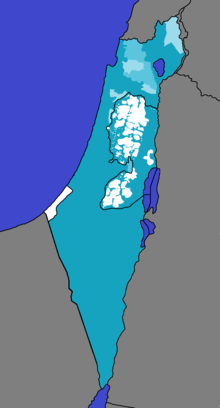 Map showing languages in Israel, West Bank and Gaza Strip. Blue shows dominantly Hebrew speaking areas, lighter blue shows mixed Hebrew and Arabic speaking areas, white shows dominantly Arabic speaking areas. The judicial system of Israel consists of secular courts and religious courts. The law courts constitute a separate and independent unit of Israel's Ministry of Justice. The system is headed by the President of the Supreme Court and the Minister of Justice. Note: for exact dates in the Gregorian calendar see Jewish holidays 2000-2050. Conscription exists in Israel for all Israeli citizens over the age of 18 who are Jewish, Druze, or Circassian; Arab citizens of Israel are not conscripted. Other exceptions are made on religious, physical, or psychological grounds. The normal length of compulsory service is currently two years and eight months for men (with some roles requiring an additional four months of service), and two years for women. Most energy in Israel comes from hydrocarbon fuels. The country's total primary energy demand is significantly higher than its total primary energy production, relying heavily on imports to meet its energy needs. Total primary energy consumption was 1.037 quad (304 TWh) in 2016, or 26.2 Mtoe (million tonne of oil equivalent). The music of Israel is a combination of Jewish and non-Jewish music traditions that have come together over the course of a century to create a distinctive musical culture. For almost 150 years, musicians have sought original stylistic elements that would define the emerging national spirit. In addition to creating an Israeli style and sound, Israel's musicians have made significant contributions to classical, jazz, pop rock and other international music genres. Since the 1970s, there has been a flowering of musical diversity, with Israeli rock, folk and jazz musicians creating and performing extensively, both locally and abroad. Many of the world's top classical musicians are Israelis or Israeli expatriates. The works of Israeli classical composers have been performed by leading orchestras worldwide. The Israel Police (Hebrew: משטרת ישראל‎, translit. Mišteret Yisra'el; Arabic: شرطة إسرائيل‎, translit. Shurtat Isrāʼīl) is the civilian police force of Israel. As with most other police forces in the world, its duties include crime fighting, traffic control, maintaining public safety, and counter-terrorism. It is under the jurisdiction of the Minister of Public Security. The Kingdom of Israel and the Kingdom of Judah were related kingdoms from the Iron Age period of the ancient Levant. The Kingdom of Israel emerged as an important local power by the 10th century BCE before falling to the Neo-Assyrian Empire in 722 BCE. Israel's southern neighbor, the Kingdom of Judah, emerged in the 8th or 9th century BCE and later became a client state of first the Neo-Assyrian Empire and then the Neo-Babylonian Empire before a revolt against the latter led to its destruction in 586 BCE. Following the fall of Babylon to the Achaemenid Empire under Cyrus the Great in 539 BCE, some Judean exiles returned to Jerusalem, inaugurating the formative period in the development of a distinctive Judahite identity in the province of Yehud Medinata. The archaeology of Israel is the study of the archaeology of the present-day Israel, stretching from prehistory through three millennia of documented history. The ancient Land of Israel was a geographical bridge between the political and cultural centers of Mesopotamia and Egypt. Despite the importance of the country to three major religions, serious archaeological research only began in the 15th century. The first major work on the antiquities of Israel was Adriaan Reland's Palestina ex monumentis veteribus, published in 1709. Edward Robinson, an American theologian who visited the country in 1838, published the first topographical studies. Lady Hester Stanhope performed the first modern excavation at Ashkelon in 1815. A Frenchman, Louis Felicien de Saucy, embarked on early "modern" excavations in 1850. ... that the journalist behind the Narada sting operation was inspired by Israeli Mossad officer Mike Harari? ... that Israeli scholar Esther Farbstein and a colleague discovered more than 100 personal Holocaust accounts in rabbinical works, a resource previously overlooked by Holocaust researchers? ... that as CEO of Intel Israel, Maxine Fassberg encouraged women, Arabs, Druze, and Haredi Jews to enter the high-tech sector? ... that Israel Beltrán Montes was elected twice to the Chamber of Deputies and twice as municipal president of Ciudad Cuauhtémoc? ... that the Assyrian captivity of the Israelites was one instance of forced resettlement carried out by the Neo-Assyrian Empire? 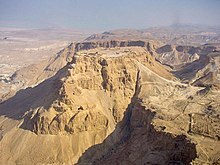 ... that Oskar Gottlieb Blarr, "the composer with the hat", visited Israel to experience where Jesus lived as a Jew? Do you have a question about Israel that you can't find the answer to? For editor resources and to collaborate with other editors on improving Wikipedia's Israel-related articles, see WikiProject Israel.